India's star opening batsman Gautam Gambhir has announced his retirement from all forms cricket. Gambhir who played the most important role in winning two world cups were running out of the Indian team for a long time. 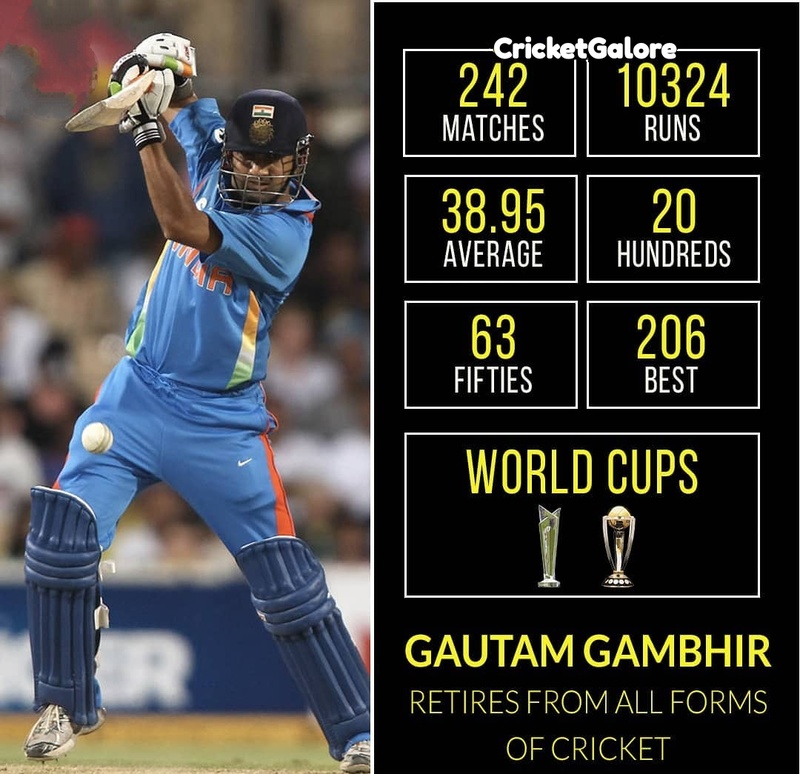 Gambhir, who is considered as the big match player, played 242 international matches, which includes 58 Tests, 147 ODIs and 37 T20 matches. In these matches, he scored 10,324 runs, with 20 centuries and 63 half-centuries. Today we will dedicate this article to the wonderful player with 3 of his most memorable knocks. Let's see. Gautam Gambhir scored 150 runs in ODI's twice, but this innings special, Chasing the target of 316, Team India lost the wicket of Sachin and Sehwag at the score of 23. After this, Gautam Gambhir, along with young Virat Kohli, added 224 runs. In that match, Gauti scored 150 runs off 137 balls with the help of 14 fours. A superb knock under severe pressure, in final of the inaugural T20 World cup when the Pakistani bowlers were sending Indian batsmen to the pavilion but Gambhir played a magnificent 75-run inning of 54 balls with 8 fours and 2 sixes. With this amazing performance, the Indian team scored 157 runs and won the final by 5 runs and became the first World T20 champion. This inning is considered as the finest innings of Gautam Gambhir. Even though he could not complete the century but India lifted the World Cup after 28 years. After Sehwag and Sachin lost there at the score of 31, he ensured the victory of the Indian team by scoring 97 runs in 122 balls. So Friends, Which of this knock is your most favourite? Do send us your valuable feedback below.